Earn $16.44 in Rewards credit (1644 points) What's This? 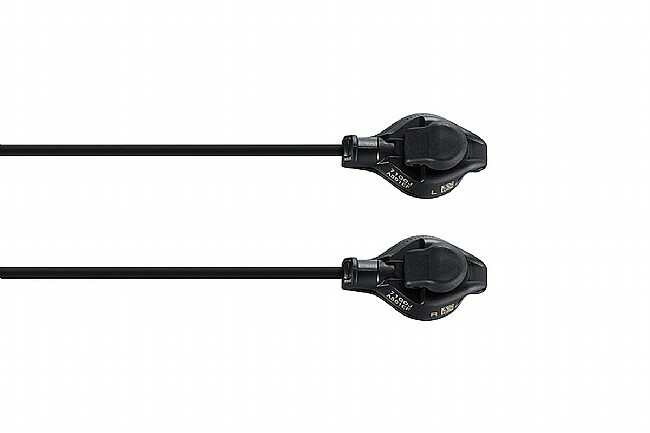 Whether you're in the lead group at the base of the final climb or it's been a long day of climbing, the Shimano SW-R9150 Di2 Climber Switch Set is the perfect tool to make your climbs that much easier. Rely on the quick and precise shifting of your Di2 drivetrain, but now shift from whichever position you choose with these simple single-button switches that zip tie to the handlebars. Simply plug the integrate E-Tube wire into your shifter bodies and you're ready to ride. Each switch can be reprogrammed with Shimano's E-Tube Project to perform a variety of shifting tasks. Compatible with Dura-Ace 9100, Dura-Ace 9070, Ultegra 6770, and Ultegra 6870 groupsets. Includes a right and left SW-R9150 Shifter Switch, 2 left mounting adapters (one narrow and one wide), 2 right mounting adapters (one narrow and one ride), and 4 zip ties. Actual weight: 21g with adapters.